Do you want to find the most affordable pet insurance? Sign online to learn about the best in pet insurance. but with our knowledgeable information, you will be well informed for all your pet insurance needs! Holoprosencephaly is a type of cephalic disorder. This is a disorder characterized by the failure of the prosencephalon (the forebrain of the embryo) to develop. Medical experts have helped back up the authenticity of a photo of a one-eyed kitten named Cy, following scepticism when it turned up on various websites. Holoprosencephaly causes facial deformities, according to America’s National Institute for Neurological Disorders and Stroke, part of the National Institutes of Health. In the worst cases, a single eye is located where the nose should be, according to the institute’s website. 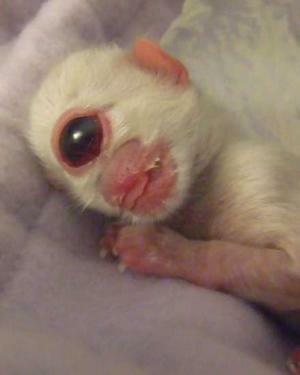 Traci Allen says the kitten she named Cy, short for Cyclops, was born on the night of December 28 with the single eye and no nose. “You don’t expect to see something like that,” 35-year-old Allen said from her home in Redmond, in central Oregon. Allen said she stayed up all night with the deformed kitten on her recliner, feeding Cy a liquid formula through a syringe. She says she cared for the kitten the next day as well, until it died that evening. Allen had taken digital pictures that she provided to The Associated Press. Some bloggers questioned the authenticity of the photo distributed on January 6. AP regional photo editor Tom Stathis said he took extensive steps to confirm the one-eyed cat was not a hoax. Stathis had Allen ship him the memory card that was in her camera. On the card were a number of pictures – including holiday snapshots, and four pictures of a one-eyed kitten. The kitten pictures showed the animal from different perspectives. Fabricating those images in sequence and in the camera’s original picture format, from the varying perspectives, would have been virtually impossible, Stathis said. Meanwhile, Cy the one-eyed cat may be dead, but it has not left the building. Allen said she’s keeping the cat’s corpse in her freezer for now, in case scientists would like it for research. 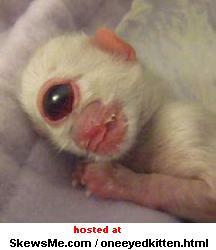  Experts back one-eyed kitten photo, Ireland On-Line, Jan 11, 2006.